How to search and view existing talk(dialogue) templates? 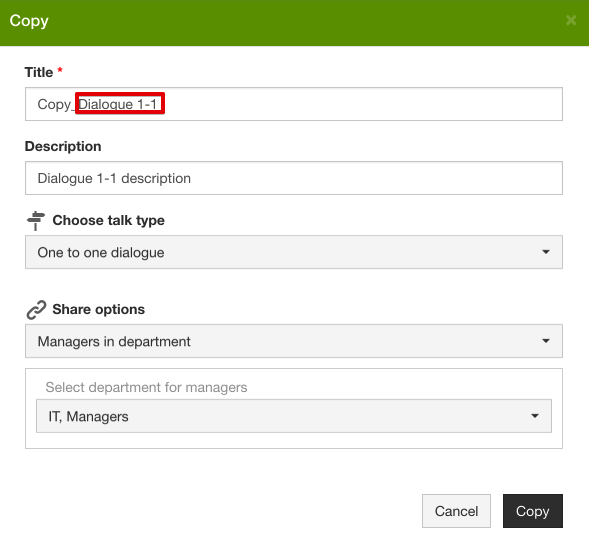 To view all the existing Talk templates, you should choose TEMPLATES in the top menue and then TALK TEMPLATES. Talk templates can be sorted by Creator, Title, Update date. You can also see which Share option has been selected for specific template. It can be one or several at the same time. One of the share options - Access denied (if None was chosen).In this case the template is visible in the list of templates but impossible to choose for the talk. If you click on the OPTIONS button you will see the list of actions you can perform on each talk. In view mode it is not possible for user to edit the template. But if the user has enough rights it is possible to copy it right away. While editing existing template, same options as in the moment of Creating one are available. In addition it is also possible to create a copy of tis template right away. Mind that there might be running talks using this form! 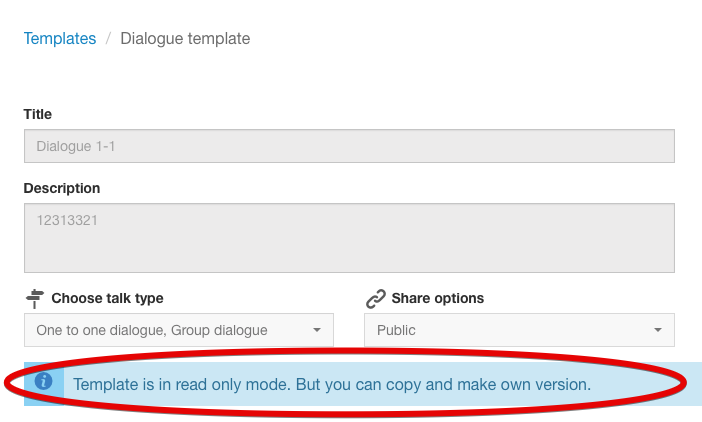 *Note: If your company has the Tags module enabled, you can tick the talks you need or all of them at once and add tags to them. It will help you later to use the search and build statistics. If you hoover on the colorful dots, you will see which tags have been added to the specific template.